DWIGHT EISENHOWER: "Three days from now, after half a century in the service of our country, I shall lay down the responsibilities of office as, in traditional and solemn ceremony, the authority of the presidency is vested in my successor. This evening, I come to you with a message of leave-taking and farewell, and to share a few final thoughts with you, my countrymen." Dwight Eisenhower was elected president in nineteen fifty-two. The following year, the Korean War ended with an armistice, a ceasefire agreement. During his presidency, Eisenhower began a tradition of meetings between the leaders of the United States and the Soviet Union. He met with Soviet leaders Nikolai Bulganin and Nikita Khrushchev. These meetings may have helped reduce the threat of a nuclear war between the two countries during the Cold War. By nineteen sixty, Eisenhower had served two terms. The Constitution was changed to prevent presidents from being elected more than twice, after Franklin Roosevelt won four times. "Now this conjunction of an immense military establishment and a large arms industry is new in the American experience. The total influence -- economic, political, even spiritual -- is felt in every city, every statehouse, every office of the Federal government. We recognize the imperative need for this development. Yet, we must not fail to comprehend its grave implications. Our toil, resources, and livelihood are all involved. So is the very structure of our society. At the end of Eisenhower's first term, he was still very popular. He had suffered a heart attack, but the Republican president felt strong enough to campaign again in nineteen fifty-six. His Democratic Party opponent was Adlai Stevenson. They had been the candidates in the presidential election four years earlier. This time, Eisenhower won almost ten million more votes than Stevenson -- an even bigger victory than in nineteen fifty-two. 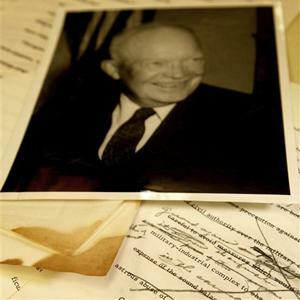 Eisenhower's second term, however, presented problems. The Soviet Union launched the space age by putting the first satellite into orbit around Earth. Fidel Castro established a communist government in Cuba. Many white Americans were fighting the Supreme Court's decision to end racial separation in schools. And the American economy suffered a recession. Eisenhower's popularity dropped during his second term. This would make it more difficult for the Republican Party's next candidate for president. The delegates who attended the presidential nominating convention in the summer of nineteen-sixty feared that their party would lose the election in November. They had to find the strongest candidate possible. Many believed that Richard Nixon was the strongest. Nixon had been a senator and a member of the House of Representatives. He had been Eisenhower's vice president for eight years. When Eisenhower suffered several serious illnesses, Nixon had a chance to show his abilities to lead the nation. He showed great strength while facing an angry crowd during a trip to South America. He also gained support when he defended the United States to Khrushchev during a trip to the Soviet Union. Nixon's closest opponent for the Republican nomination was Nelson Rockefeller. Rockefeller was the governor of New York state. He came from one of the richest families in America. Richard Nixon easily won the support of the party. The delegates nominated him on the first vote. He accepted the nomination. And he called for new efforts for peace and freedom around the world. The race for the Democratic nomination was much more difficult. The Democratic Party thought it would have no problem winning the presidential election. Many candidates entered the race for the nomination. One was Senator Hubert Humphrey of Minnesota. Another was Senator John Kennedy of Massachusetts. Humphrey had been elected to the Senate three times. He was a strong activist for civil rights and peace. Kennedy was a Navy hero in World War Two. He was handsome and only forty-three years old. He was also Roman Catholic. No Catholic had ever been elected president of the United States. Kennedy and Humphrey began to compete in state primary elections, the first step in the nominating process. Kennedy won an important primary in Wisconsin. But voters in Protestant areas of that state did not support him. The question then became: could he win in another state, West Virginia. Most of the voters in that state were Protestant. On the last night of the primary campaign in West Virginia, Kennedy spoke about his religion. He said the president of the United States promises to defend the Constitution. And that, he said, includes the separation of the government from any religion or church. Kennedy won a big victory in West Virginia. He then went on to win many votes in other primaries. He received the nomination on the first vote at the Democratic convention. In his acceptance speech, he said he would ask Americans to help their country and sacrifice for their country. After the party conventions, the two candidates -- Kennedy and Nixon -- began to campaign around the country. Nixon charged that Kennedy was too young to be president. He said Kennedy did not know enough about governing. Kennedy attacked the Republican record of the past eight years. He said President Eisenhower and Vice President Nixon had not done enough to bring progress to the nation. Protestant groups expressed concerns about Kennedy's religion. They wondered if he would be influenced by the pope. They wondered if the leader of the Roman Catholic Church would try to make policy for the United States. Kennedy answered by repeating his strong support for the constitutional separation of church and state. Public opinion surveys showed the election campaign to be very close. Then the candidates agreed to hold four debates on television. In the first debate, the candidates showed they did not differ too widely on major issues. Kennedy appeared calm and sure. But Nixon did not feel well. He appeared thin and tired. Many people who had not considered voting for Kennedy now began to change their minds. To them, he looked more presidential. Most people seemed to feel that Kennedy won the first debate. Nixon probably won the second one. And both men did about the same in the last two. 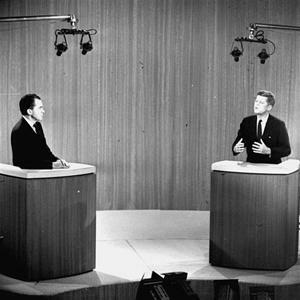 In the fourth debate, they expressed widely different opinions about whether the United States was making progress. Kennedy believed there had been little progress under Eisenhower and Nixon. JOHN KENNEDY: "Franklin Roosevelt said in nineteen-thirty-six that that generation of Americans had a rendezvous with destiny. I believe in nineteen-sixty and sixty-one and two and three, we have a rendezvous with destiny. And I believe it incumbent upon us to be defenders of the United States and the defenders of freedom. And to do that, we must give this country leadership. And we must get America moving again." Nixon disagreed. He believed the United States had not been standing still, but there was more to be done. RICHARD NIXON: "It is essential with the conflict that we have around the world that we not just hold our own, that we not keep just freedom for ourselves. It is essential that we extend freedom, extend it to all the world. And this means more than what we've been doing. It means keeping America even stronger militarily than she is. It means seeing that our economy moves forward even faster than it has. It means making more progress in civil rights than we have, so that we can be a splendid example for all the world to see." Another issue in the nineteen sixty presidential debates was the Chinese attack on the islands of Quemoy and Matsu in the Taiwan Strait. And another was how to deal with Soviet leader Nikita Khrushchev. After the debates, the presidential candidates campaigned around the country again. Nixon proposed that if he were elected, he would travel to Eastern Europe and meet with Khrushchev. Kennedy proposed the Peace Corps, a program to send Americans to developing countries to provide technical aid and other help. On Election Day in November, the voters chose John Kennedy as their thirty-fifth president. His victory, however, was a close one. Almost sixty-nine million people voted. Kennedy won by fewer than one hundred twenty thousand votes. The beginning of his presidency will be our story next week. You can find our series online with transcripts, MP3s, podcasts, and pictures at www.unsv.com. 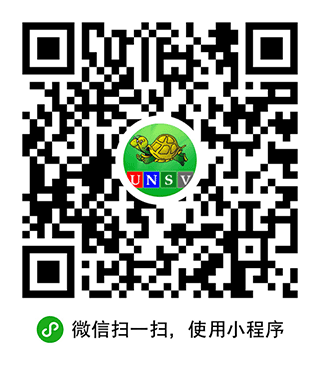 And you can follow us on Facebook and Twitter at VOA Learning English. I'm Steve Ember, inviting you to join us again next week for THE MAKING OF A NATION -- American history in VOA Special English.